The history of Sri Lanka is obsolete, stagnant and stale. It is based on blind beliefs and history mixed with traditions. Backwardness and the primordial state of society was very often retained and preserved due to the insular characteristics and mentality which had the heritage, to a greater extent, of island kingdoms. Although media techniques exists on a higher plane and though diverse and rich intellectual thinking streams reached society, yet all these got submerged and the social mentality was retained within the traditional thinking sphere. This is due to the fact and the belief that was created, that all alien concepts went to destroy the self-intellectual life. While the traditional social "image" worked in a very subtle way to discard all external things; to safeguard the society wherever they were confirmed. But the "radical image" of the new generation utilizes these alien intellectual and thinking streams not to destroy the entire social structure. They attack the individual factors, to build up an intellectual authority. Within such a background the work – "Living Gods" came to light to destroy social reaction and bringing historical evolution. 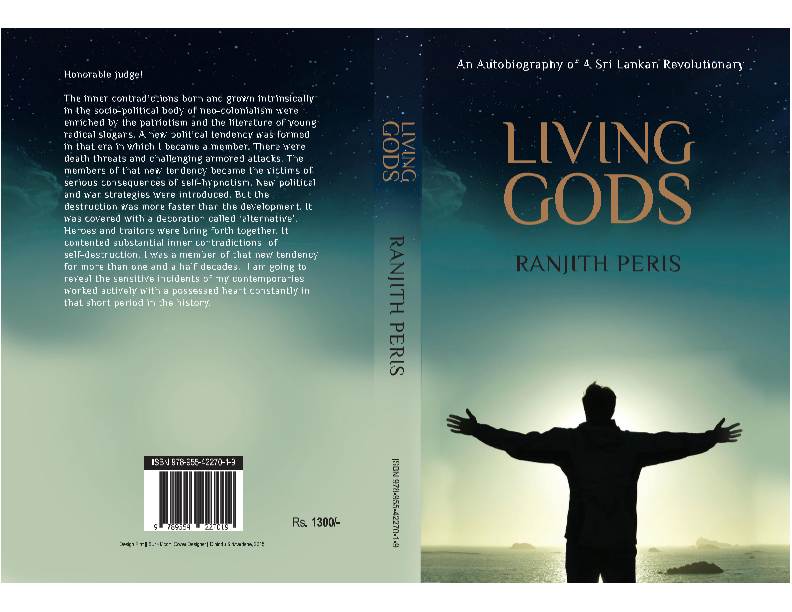 The author of "Living Gods" in order to expose the contemporary Sri Lankan social reality made use of a strategy, which so far has not been utilized by any Sri Lankan author ad, such strategy was dangerous. "Living Gods" obtained its moral applicability divulging the author's life very clearly. This work which consists of seven chapters and 633 pages (in Sinhala) spread towards the beginning of the author's life. This chapter expresses the ways to which the hero and his peers submitted their youthful reciprocation towards the traditional customs and habits and to the blind beliefs bound up with human birth, infant stage and the human life. This chapter deals at length the beginning of a long radical political process. These groups of youths became victims to the political culture, which was behind the fall of religious beliefs and the proportionate growth of materialistic concepts. The youths were magnetically attracted towards the traditional aims and objects of politics, determinations precedents and strategies within sub political culture. As against the traditional priesthood who preached Nihilism, while being greedy towards Material wealth, the youths on the contrary exhibited scarcity, simplicity, selflessness, and devotion while leveling moral challenges. In this chapter the youths start a struggle based on conflicts of opinions against the traditional blind beliefs and against traditions based on such blind beliefs. Such exchange of ideas was between spiritualism and materialism and that was made known as a discussion based on conflicts of opinions. Amidst the attractive arguments the traditional priesthood backed out. After this the narrative describes the incidents about the change of strategies in capturing state power and the conflicts of opinion among the youths and the physical conflict that arose. The conflicts that existed among institutions within diverse schools of Marxism, which considered "Socialism" as their sole political running heritage. And out of those institutions the most powerful one, which came toward, and the conflict of opinions among them and its diversity the subtle strategies followed in the management of people. The proportionate internal conflict in keeping with the growth of the institutions. And the observance of good obedience is with matters dealt with in this chapter. This chapter deals with the narration fully with the realities prevalent in prisons and prison camps in Sri Lanka. It also reveals the nature and the existence of political prisoners. Teachers have inculcated in the minds of students as good institutions "correctional institutions" for prisons. This chapter reveals acute and terrible and several internal secrets within these prisons. This chapter reveals the prison life, the violent reciprocations of the novice political prisoners; the mean, defeatist, and timid symptoms; the tale of prisoners who were subjected to acute and terrible cut-throatism and let downs, the internal conflicts of opinions of prisoners and violent conflicts, flights, retroactive legal regulations which sacrilege the legal morality, Commission equipped with super judicial authority, judicial creations mixed with sarcasm and the rulings, the courts which were created by prisons and rulings of such courts which were implemented in a violent way and sexual indulgence which exceeded all bounds of morality in this chapter.